Refrigerator pickles are kind of like entry-level preserving for those of us who aspire to be like Martha Stewart, but don’t have the time, patience or domestic staff. 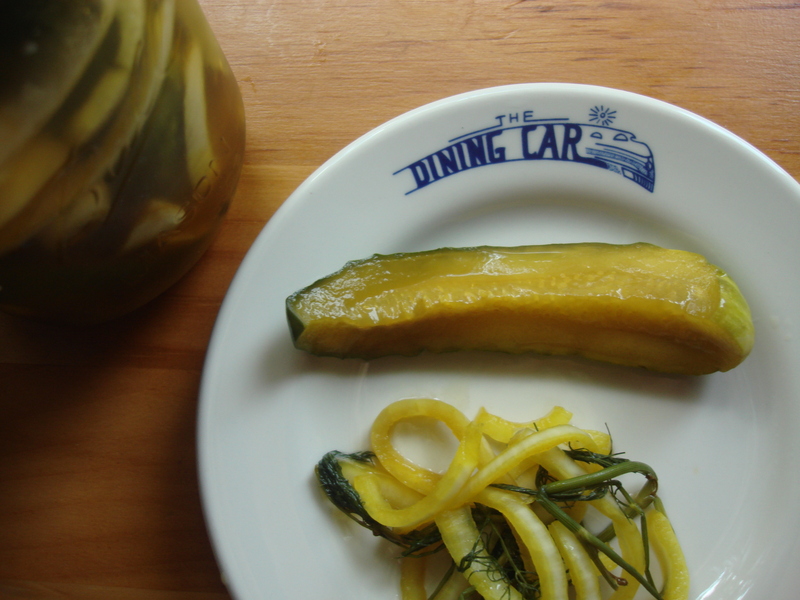 I started making them last year with a bumper crop of CSA pickles and zucchini and had so much fun, instant gratification and praise that I have kept going. I actually entered them in the Long Island Fair last fall, but the jar cracked and put me out of the running (wardrobe malfunction of the foodista variety). I will try again next year (so don’t even think about trying to enter this recipe on your own!). These are a really popular item at BBQs and nice hostess gifts for wherever you are going to have dinner. By all means play around with the ingredients; I think turmeric is crucial, but leave it out for a more pure dill flavor. And really, they don’t take more than 30 minutes to get in the jars if you arrange your ingredients ahead of time. Use labels to keep track of ingredients and Best By date (they keep about 3 months in the fridge). Divide cucumber and dry ingredients (except sugar) evenly between four quart jars with lids. Stir together brown sugar, vinegars and water. Cover and chill. You can start eating them after 24 hours and they will keep up to three months in the fridge. Eat the onions too! Since I will be making these today with my friends Lori and John, I thought it was worth a reblog! Easy and delicious…will go well well with some local craft beer and at a family and neighbor BBQ reunion this coming week! Hi Natalia, I finally made these pickles with the kirby cucumbers that were tempting me at the local greenmarket and they are fantastic!! But I took it a step further and pickled some green and wax beans, too! I remembered that Hogue Cellars winery in Oregon does green bean pickles so I figured it would work and they are good and yummy and crunchy! I didn’t cook the beans at all, just put them in a taller jar along with all the other ingredients….plus some red pepper flakes for a hint of heat. Thanks for this easy and delicious recipe! I want to try this with okra! Love me some spicy pickled okra – YUM! Oooh, what a wonderful idea!!!! Let me know how it goes…. Thanks for the feedback, Katie! I am so glad that the recipe worked out for you; please feel free to contribute any tweaks or twists you made to the recipe! You could certainly pickle zucchini! Using the basic proportions of sugar, vinegar and water, you could also pickle radishes or sliced onions, perhaps changing the spices to suit. sounds easy….what else could you pickle using that same recipe? ❤ pickles! I can eat a whole jar in one sitting.